When I was at Falmouth College of Arts my passion was, and still is, photographing people. I shot various projects whilst studying photography but one of my favourites was photographing some old salty sea dogs. So over the next few weeks I will post some pictures. Frank woke up one morning, drew back his curtains and looked out into the creek to see his boat. All he could see was a mast sticking up! His boat had been hit in the night and sunk. I’m afraid I can’t recall how it got hit, maybe a drunk local going home from the Pandora Inn?! So, his boat was pulled up and taken to Mylor harbour where it appeared the damage was to great to repair and at the age of 80 something Frank decided it was time to hang up his nets and retire! He recovered the bowsprit ( the bit of wood that sticks out of the front of the boat!) and in his spare time he made the boat wheel which he is holding in the pictures below from the reclaimed wood. His boat, the Morning Star was bought and is now on display at Lands End museum – cut in half and attached to the wall I believe! 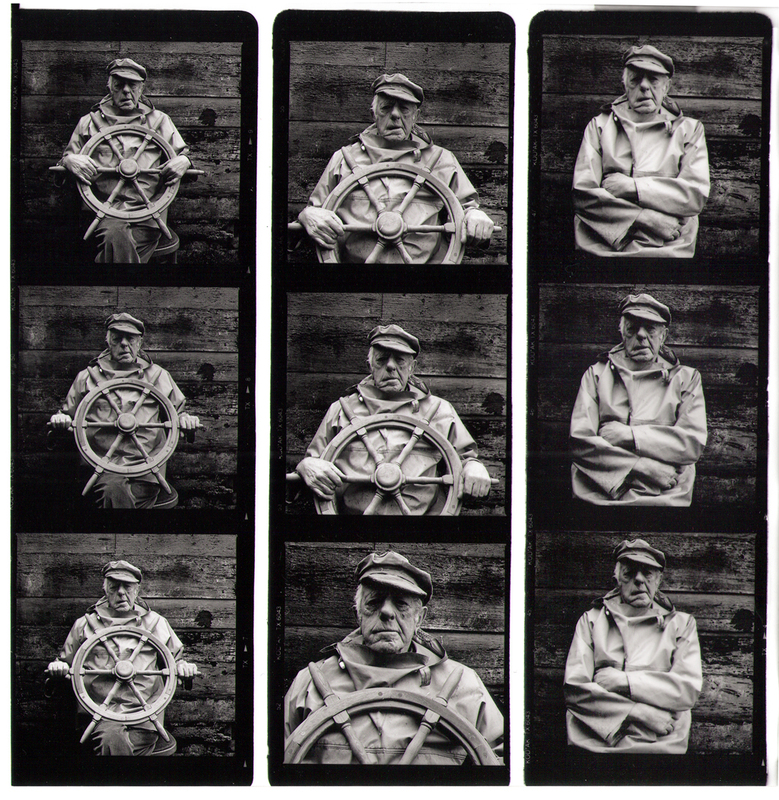 Here is a contact print of 3 pictures from my trusty Hasselblad – now sadly also retired! These pictures are a real blast from the past for me as I have not looked at them in years. Good old Tri – X film rated at 1600 – you’ve got to love it! He was a dear man, I will never forget that misty old afternoon I met and photographed Frank. If anyone has any more information or pictures of Frank I would love to add them to my blog. Please email me at mysaffronbun@gmail.com Thank you.